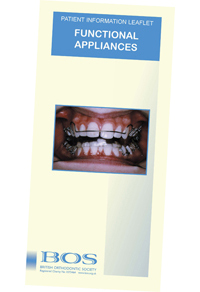 It is sometimes possible to change the way the jaws grow, using functional appliances. These braces use the power of your jaw muscles and can help with certain types of problem. Functional braces can come in either one or two parts. We use a two part functional brace called a twin block appliance, as it tends to have better patient compliance. A functional brace encourages the lower jaw to sit in a better position in relation to the occlusion. The effect of the twin block is to stretch the jaw muscles, encouraging the bones and teeth to grow into a more favourable position. Functional braces achieve the best results if they are worn all the time and if the patient is growing. They should only be left out for eating, playing contact sports and swimming. When first fitted they can cause the jaw muscles to ache as they are being constantly stretched. It is important that you persevere with the functional brace and take some simple painkillers, the type you would normally take for a headache. After a week or so you should start to find it feels strange without the brace in and you will start to notice changes in the position of your teeth.